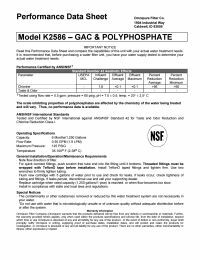 The Omnipure K-Series K2586-BB inline filter is a GAC phosphate filter. This filter has 1/4" NPT that make the filter really easy to install and replace. This filter can go in ice makers, refrigerators, beverage equipment, drinking fountains. The Reverse Osmosis Systems work with purification systems to provide to purest drinking water possible. The K2586-BB removes bad taste, odor and chlorine. along with 6 ounces of polyphosphate scale inhibitor. Filter Dimensions: 10" x 2"